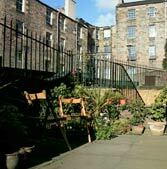 10 minutes walk from Princes Street. Corrina Seddon's basement flat is a nice hideaway apartment, in a quiet street in old Georgian Edinburgh, - just a leisurely 10 minutes walk from Princes Street. 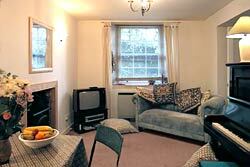 It is available as a self-catering weekly rental (and sometimes for shorter breaks). Behind the Georgian Town-houses of Cumberland Street small cobbled roads were built to service them. 175 years ago North East Lane would have been bustling with activity - cooks, grooms, horses and carriages - but today it has little traffic, and is quietly residential. Accommodation is most suitable for two people sharing the double bedroom, but there is also a small box bedroom - see below. 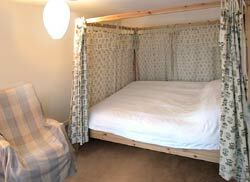 The bedroom is simply furnished with a cosy four poster double bed (two views above). The bathroom right has a bathtub with shower. There's also a further box-bedroom left. Although this room has no windows it can be used for sleeping, and has a single bed and another fold-away single bed. Kitchen and living room/dining room are connected by an arch. The kitchen has a fridge/freezer, microwave oven, electric cooker and washer/dryer. The living room has a dining table, piano, TV with VCR and a convincingly real electric "wood burning stove". Heating throughout the apartment is by electric storage. 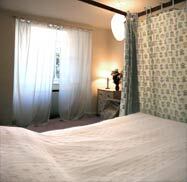 Electricity, bedlinen and towels are included in the rental tariff. £250 to £450 per week depending on the season. 3 day breaks; (Friday, Saturday and Sunday nights) for £130 are sometimes available. 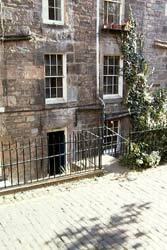 Or, depending on availability, £50 per night. The small sitting out area with shrubs and plants in pots can be a sunny place for supper on a summer evening. Please tell Corrina you found Flat 2 through About Scotland!